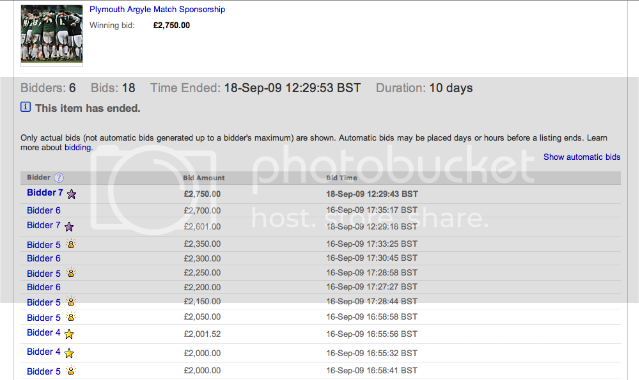 The Plymouth Argyle sponsorship auction on eBay came to an end this morning with a last minute bid for £2,750.00. In total, there were 18 bids from seven bidders. So did the power of an efficient market work? Ashley Read from Sport Driven estimates that the package would normally be priced at about the reserve price of £1,500. Not taking into account, the windfall of free publicity Plymouth Argyle got, to boot! The one downside, it's not clear to us (or possibly even Plymouth Argyle either) yet who the buyer is. Previously, we questioned why the team wouldn't present any restrictions on categories/brands that the sponsorship offer was limited to. Conflicts with existing sponsors, unsavory brands, etc. could present an interesting set of issues. Does the model have legs? I see a lot of unknown variables that are difficult to gauge in an anonymous environment and it's of course tough to customize a sponsorship package, as most sponsors want to do, after an auction has already started. In any case, any ideas on who the mystery buyer might be?